Ginger is perhaps the world’s oldest recognized medicinal plant and arguably one of the most important. Native to south-east Asia, ginger is traditionally thought to have been cultivated for its medicinal value for over 5000 years, although the first mention of the plant is found in Chinese writings dating back to about 400 BC. Both Traditional Chinese and Ayurvedic herbalists use the plant extensively; in fact, it’s estimated over half of Chinese herbal formulas include ginger. In Ayurvedic (Indian) herbalism ginger is labeled the “universal medicine” and is touted to have come from the Garden of Eden. Ginger’s botanical name was derived from the Sanskrit word, singabera, which means “horn-shaped” – an obvious reference to the most coveted part of the plant, its rhizome (root). Ginger’s rhizome is light brown externally, with a yellow, fibrous, inner flesh. It grows horizontally with several gnarly, branching “fingers” just beneath the soil’s surface to lengths up to 16 cm. These rhizomes are harvested when plants are between 6-12 months old. The rhizome vertically produces reed-like shoots, some growing more than 4 ft tall, that boast of smooth, pale green leaves and brilliantly colored flowers. The plant loves the shade and grows best in moist, fertile soil under humid, tropical conditions. India is currently the world’s largest producer of this perennial plant which belongs to the same botanical family as cardamom and turmeric. Ginger’s pungent, spicy taste is a notable indication of the plant’s actions as a blood-mover and diaphoretic. Of ginger’s 115 recognized medicinal constituents, most belong to either the oleoresin group or the volatile oil group. Specifically two bioactive oleoresins, gingerol (the most abundant component in ginger root) and shogaol, are responsible for ginger’s blood-moving and diaphoretic activity; both have been the subjects of numerous studies. Shogaols are greatly pronounced in dried ginger root, which is why the dried root is considered to be “hotter” than fresh. In fact, Chinese herbal medicine makes a clear distinction between these two forms, claiming fresh ginger is better for its diaphoretic action, while dried ginger is best for digestive and respiratory issues. Both forms of ginger have been used in studies and seem to be equally effective. Historically, herbalists have prized ginger for its function as a stimulating diaphoretic. Diaphoretic herbs heat the body up by increasing blood flow and promoting outward circulation and perspiration. This is especially helpful in supporting the body during times of fever (specifically when the individual is chilled) or in cases of stagnation of the blood (delayed menses, for example) or the mucosal membranes (i.e. thick mucus). Ginger’s ability to stimulate circulation significantly benefits the musculoskeletal system, too, as it increases peripheral blood flow. This action reduces swelling and muscle stiffness while delivering nourishment to the muscles and bones. Additionally, both the oleoresins and zingibain (a proteolytic enzyme found in ginger) have demonstrated a significant ability to decrease inflammation. When stimulating the mucosal membranes, ginger’s antimicrobial action works to support the eradication of bacterial and viral infections. Freshly juiced ginger is most effective for this function, but a tincture of the fresh root is also beneficial. Dried ginger root possesses very little antimicrobial action. Lastly, ginger’s warming and stimulating actions make it a catalyst herb; an herb that increases the healing actions of an herbal formula by efficiently and quickly distributing the herbal constituents throughout the bloodstream. Ginger is best indicated in cases where a person is chilled, (often with cold extremities) and where modalities are made worse in cold, damp and/or windy weather. As if all these wonderful benefits aren’t enough, ginger’s most popular therapeutic use is as a digestive aid with traditional applications for indigestion, flatulence, diarrhea, and relief of nausea and vomiting. Studies have shown that ginger’s botanical constituents appear to accumulate in the gastrointestinal tract, hence the reason why the plant’s herbal actions significantly target this area. 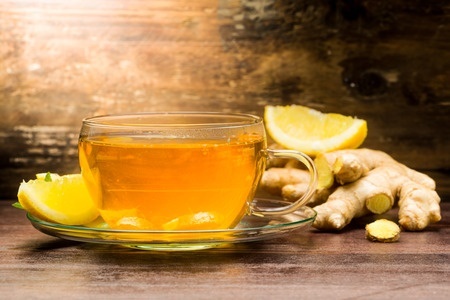 The antiemetic action of ginger is directly related to the carminative action of its aromatic volatile oils (terpenes including zingiberol and zingiberene) and the presence of ginger’s protolytic enzymes. Also the oleoresins gingerol and shogaol have been recognized to stimulate gastrointestinal motility by increasing the flow of saliva, bile and other gastric secretions while promoting gentle peristalsis that moves food through the digestive tract. This ultimately breaks up and expels intestinal gas while improving digestive function. In addition to its support of the upper digestive tract, recent studies suggest ginger plays a key role in the lower tract as well. The antioxidant and anti-inflammatory effects of this herb are valuable in the treatment of irritable bowel syndrome (IBS) and ulcerative colitis. Moreover, ginger also boasts of angiogenesis-inhibiting and apoptosis-promoting compounds, which make it a likely candidate for the prevention of colon cancer. This universal, stimulating herb offers us so much more than just culinary delight. Ginger has demonstrated its value for thousands of years as an asset for overcoming a variety of health issues stemming from respiratory to cardiovascular to digestive ailments. And it’s a key asset to any natural medicine cabinet. 1. Place the desired ratio of herbs into a glass jar. 2. Fill the jar with vodka (or brandy). 3. Cover and shake well. Label. 4. Place jar in a dark, cool location and leave for 2 – 6 weeks. 5. Strain herbs and bottle, adding a little honey to taste as desired prior to bottling. 1. Ajayi, B., Adedara, I. & Farombi, E. Pharmacological activity of 6-gingerol in dextran sulphate sodium-induced ulcerative colitis in BALB/c mice.Phytotherapy research : PTR. 4, (2015). 3. Buhner, S. H. Herbal antibiotics, 2nd edition: Natural alternatives for treating drug-resistant bacteria. (Storey Publishing, 2012). 4. Duke, J. A. The green pharmacy herbal handbook: Your comprehensive reference to the best herbs for healing. (Rodale Books, 2000). 5. Foster, S., Johnson, R. L. & Steven, F. ‘National geographic’ desk reference to nature’s medicine. (National Geographic Society, 2008). 6. Hechtman, L. M. Clinical Naturopathic medicine. (Harcourt Publishers Group (Australia) Pty., 2014). 7. Hoffmann, D. & Hoffmann, F. N. Medical Herbalism: The science principles and practices of herbal medicine. (Inner Traditions Bear & Company, 2003). 8. Mabey, R., McIntyre, A. & McIntyre, M.The new age Herbalist: How to use herbs for healing, nutrition, body care and relaxation. (Simon and Schuster, 1988). 9. Pedersen, M. Nutritional herbology: A reference guide to herbs. (Whitman, Wendell W. Company, 2012). 10. Rhizome Zingiberis. World Health Organization Monographs on Selected Medicinal Plants 1, 277–287 (1999). at <www.apps.who.int/medicinedocs/en/d/Js2200e/>. 11. Servan-Schreiber, D. Anticancer: A new way of life. (Penguin Group (USA), 2009).